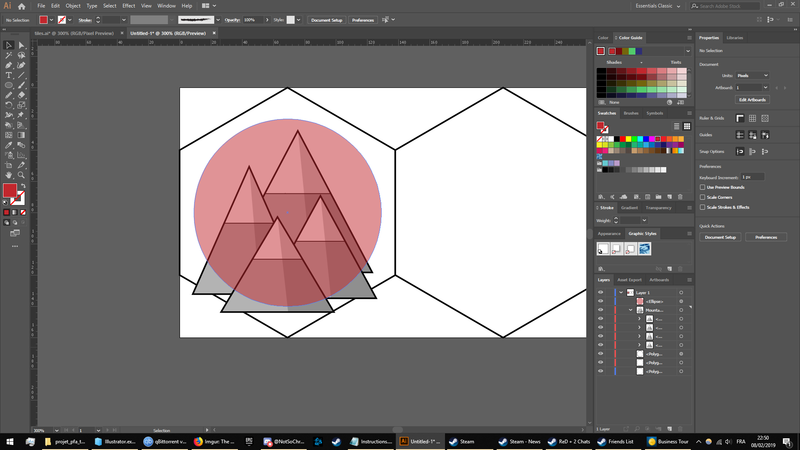 How to take a circle out of a scene on Adobe Illustrator? So, I want to take a circle out of them, only render what’s inside the circle, and erase whatever is outside. I’ve tried clipping masks, but I got weird results. Group your triangles. Select that group and the circle. Goto Object > Clipping Mask > Make. Be sure that nothig else is selected and the circle is above the group. You may notice that when your mouse hovers over the vanished parts, Illustrator occasionally show the vanished parts with the used layer registration color. But that's only in Illustrator. If that's too weird, you can use the shape builder and recreate the wanted areas by filling them with colors. Or you can lock everything else and divide with the circle objects below. Select only the circle and apply Object > Path > Divide Objects Below. In both cases you may need to ungroup and manually delete the remnants. Here's an example of the division. All triangles are closed paths.Separate line segments will not be divided. They do not any harm, they only rememind you that here is a masked shape. Clipping mask doesn't create a stroke along the clipping border. The other presented methods create one and that can be harmful. How to clip excess object? How to flatten a very complex object in Illustrator? How can I define one path for multiple shapes from either side of it in Illustrator? How to trim a bunch of open curves with a closed shape in Adobe Illustrator? How to cut out a specific color in Illustrator?